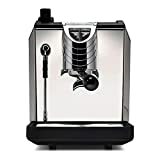 A Perfect Home Espresso Machine can bloom your lifestyle by brewing consistent shots every time and extracting all the essential oils and flavors from coffee grounds. The task of an espresso machine is to produce a highly concentrated, dark and rich textured drink. The exact working can be defined as – Finely ground beans are packed into the portafilter of the machine onto which highly pressurized boiling water is passed, the resulting outcome is called as Espresso Shot. Most of the people now days comfort themselves with having a coffee machine at home so that they can prepare their favorite drink as per convenience. Also, with a personal coffee maker, one has much control over what they are brewing. Breville Duo-Temp is a mid-range coffee machine for budding home baristas who are looking to upgrade. It may also be a good first machine if you’re already a bit familiar with the process of making espresso. This machine can be easily spotted in few small to medium sized cafes for making an excellent shot. Many experienced home baristas have been using it for a long time and are all satisfied with the performance. First of all, this Breville machine is a definite step up from the entry-level models. The precision of the PID temperature controller combined with pre-infusion allows you to get optimal results. Pressurized filter baskets make it easy to get good crema even if your grind and tamp are not perfect. With the Breville Duo-Temp, you can also start to work on your skills by using non-pressurized baskets. They require a bit better technique, but most people agree that they make a better end product. Maybe the biggest difference between this model and the high-end machines is the lack of programmability. And with the Duo-Temp, you even have to manually stop the brewing process. If you care more about the underlying quality of the machine than about program ability, this model offers excellent value for money. This is not a machine for beginners, but if you’re experienced at pulling shots, you will love the results with this machine. Priced in the mid-range the Rancilio Silvia also features a beautiful stainless steel design. It can be found in many homes and small cafes as it does makes a wonderful shot, always. The Silvia is intended for residential use, but it includes many of the same features as Rancilio’s commercial models and that is why many small cafes have been using it for making descent shots. The group head, portafilter, and boiler are all made up of solid brass, and the powerful steam wand is also commercial-grade. The portafilter handle has the same ergonomic design found in the commercial models too. What really separates this model from the commercial espresso machines is its single boiler design. Because it can’t heat milk and brew coffee back to back, you can’t produce a lot of drinks in a short amount of time like in commercial models. The Silvia is a bit unforgiving when it comes to consistency of grind and tamps. But if you’ve got the skills to deal with it, this machine will give commercial quality coffee at a more affordable price. Breville Barista Express has gained the brand a lot of popularity over years with its exceptional performance year after year. It’s a semi-automatic machine that has enough controls to make you feel like a real barista at home. What’s more, the output that comes from this machine is amazingly well and better than its competitors including super automatics too. Brewing with Barista Express is fun at home and making a great cup of coffee requires some understanding about the preparation. Before buying this machine, you must understand about coffee beans, grind size, tamping and steaming. Once you are familiar with these, Breville BES870XL is going to be your great companion and you will feel like a home barista. Its stainless steel body makes it durable for a long term and the design is elegantly well. Put your professional barista skills to the test with Gaggia’s latest installment—the Classic Machine. 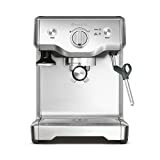 Constructed of high-grade stainless steel, this machine has the feel of a coffee shop espresso bar but is small enough for any countertop. The latest design Pannarello steam wand ensures perfect milk froth to produce barista-quality cappuccinos and lattes each and every time. Versatility. The Gaggia Classic can use either coffee grounds or Easy Serve Espresso pods, making this one of the most versatile machines available. High capacity water reservoir. With a 72 oz water reservoir, you can pull numerous shots before having to stop and top up the water. Temperature control. Two separate thermostats maintain the temperatures for brewing and steaming. Additionally, a built-in safety switch will turn the boiler off in the event of a malfunction. Durable design. The Gaggia Classic is constructed of professional grade stainless steel, providing durability to its sleek design. Professional steam wand. The Pannarello steam wand is Gaggia’s latest design, providing perfect milk foam each and every time. Convenient hot water. The steam wand doubles as a hot water dispenser, providing piping hot water for tea, hot chocolate or Americanos. Warming platform. The top of the Gaggia Classic is flat and hot to the touch while in use. This provides the perfect platform for keeping shots warm while steaming milk. Complete range of accessories. The Gaggia Classic comes complete with a portafilter, single and double shot basket, coffee tamper and coffee measure/scoop. Whether you choose to entertain friends or simply indulge in your favorite coffee shop beverage at home, the Gaggia Classic will enable you to make barista-quality drinks in the comfort of your own home. Don’t forget to put out a tip jar! Learn the tips and tricks of a professional barista with the Nuova Simonelli Oscar 2 Pour Over. It is considered as a benchmark for home and small cafeterias by professional baristas. The solid design and direct water connection mean this model can function in an industrial capacity, making it a perfect choice for small coffee shop owners. Though it costs around the range of a super automatics, the price is still worth the quality. Professional quality portafilter. The Nuova Simonelli Oscar comes with the same type of portafilter used by professional baristas at coffee shops around the world. Heat exchanger. Now you can steam your milk while pulling a shot with the same efficiency of a double boiler but at a fraction of the cost. Easy controls. With only two buttons and a steam control, the Nuova Simonelli Oscar is the epitome of uncomplicated perfection. Spacious water reservoir. The 2.3-liter water reservoir means that you can pull numerous shots before having to stop and refill with water. Direct water option. The Nuova Simonelli Oscar is equipped for connecting to your water line, allowing you to use this machine in a commercial setting as well as in your home. Warming platform. The top of the unit can serve as a warming platform, keeping shots warm while the milk is frothed. Removable drip tray. The tray at the base of the unit can be easily removed to clean any wayward drips or spills. Industrial strength. The solid construction of this unit makes it capable of surviving the stresses of a workplace environment. Whether you use the Nuova Simonelli Oscar 2 at your coffee shop or in the comfort of your own home, you can be sure of barista-quality cappuccinos and lattes with this high performing espresso maker. Grab an apron and get started! Another great option is the Breville BES920XL for those who are really serious about their espresso. Due to a high price, this option is mostly neglected but this is the best pick if you’re willing to pay more for added functionality. So we have kept this machine in middle position due to the pricing part. In addition, the dual boiler design allows making more drinks in a shorter amount of time. It’s right there in the name – dual boilers mean that it can steam milk and pull shots at the same time. And this may not sound that important if you’re just making yourself a morning latte, but if there are guests over and everyone wants a cappuccino, it saves a lot of time. Moreover, both of the Breville models reviewed here come with tampers that attach magnetically to the body of the machine. Almost many machines come with useless little plastic tampers, but Breville actually gives a decent solid metal tamper. The Breville Dual Boiler allows programming the length and temperature of the shot, as well as automatic on and off times for the machine. Therefore, this one is a great coffee maker for home if you’ve got a bigger budget and want a fast, high-quality machine with plenty of bells and whistles. Also, Breville is a company that puts a lot of care into the details. If you’re looking for an entry-level machine that doesn’t cost too much, this Hamilton Beach 40792 might the right pick for home. It’s very easy for beginners, makes a good cup of coffee and that is all that makes sense. HB 40792 is an easy machine for someone who is just learning to pull shots. The Slide and Lock feature holds the filter attachment securely in place during brewing. It comes with two filter baskets to make either single or double shot. The single shot basket can also be used with ESE pods. Users report that they get good crema with this machine. The Hamilton Beach does have some limitations. It has no programmable features at all – you even have to manually stop the flow of water when your cup is as full as you want it. Also, the housing is plastic and really isn’t built to withstand the test of time. But if you’re looking for an easy introduction to espresso making and don’t want to spend a lot of fortune on the first machine, you can’t go wrong with this model. A knock box is the best companion of an espresso maker, so get one with your saved money with this machine. Delonghi EC702 is another great pick in our collection. If you’re a first-time buyer, you might be looking for something affordable and easy to use. 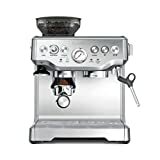 This Delonghi has got a few more features to offer than the Hamilton Beach 40792 and is one of the most popular coffee machines available in the market. Just as with the Hamilton Beach, you can use either ground coffee or ESE pods with this machine too. The pressurized portafilter baskets mean that you’ll get good crema every time even if you’re a beginner at pulling shots. The DeLonghi EC702 features a good-quality stainless steel boiler along with separate thermostat for the steam wand and the water used for brewing. The automatic self-priming means that you don’t have to wait around for a long time waiting for the machine to warm up. This machine has very little bells and whistles – no automatic shut-off, no pre-infusion, and no programmability. But if you’re just looking for a basic entry-level machine that produces great shot and steamed milk, this machine will keep you happy. Although it’s a little costlier than the Hamilton Beach which we stated above but it’s worth the money spent with the increase in the quality of coffee being produced. Taking its name from the Italian for revolutionary, the Rivo is the embodiment of Keurig’s revolutionary espresso brewing technology and it’s ease of use brings it to our list. Three steaming options allow you to enjoy a Cappuccino or a Latte, hot or iced, with a simple press of a button. With two choices of shot size, you can customize your drink by both size and strength. The split design of the Keurig Rivo enables to perform both brewing and frothing at the same time, thus ensuring to get a rich, creamy drink in under a minute each and every time. Providing top quality results with simplicity and speed is what makes this model worthy of its name—revolutionary! Three steaming options – The Rivo provides rich, perfect milk froth for Cappuccinos or Lattes, hot or iced. Speed – With a full 15 bars of pressure, every shot of espresso is flawlessly brewed in under a minute. Shot options – The two shot-settings allow you to brew single or double shots, providing drinks of custom size or strength. Split design – The split design of the Rivo means you can froth your milk while the espresso is brewing, saving valuable time and effort. Simplicity – With one touch settings, the Rivo is as simple as it is elegant. Additionally, the individual packs of espresso guarantee the perfect shot every time. Easy cleanup – When it’s time to clean your machine, simply put the parts in the dishwasher. Gone are the days of cleaning your machine by hand. The Keurig Rivo packs itself with a blend of simplicity, speed, and perfection. Now you can enjoy your favorite coffee shop beverage in the comfort of home. Whether you want to treat yourself or impress your friends, you’re only an apron away from becoming the neighborhood barista! For those who enjoy straight espresso, or rich, creamy coffee with crema, the Nespresso Vertuoline is a must have. This machine can deliver the perfect 1.35 oz shot or an 8 oz cup of velvety, smooth coffee with just a single press of a button. The Vertuoline capsule guarantees the highest quality ingredients, while the Centrifusion system promises the perfect coffee experience every single time. Centrifusion technology. The Nespresso Vertuoline uses a patented centrifugal method for brewing coffee. This method spins the coffee capsule as fast as 7,000 rotations per minute, mixing the water with the contents of the capsule to create a rich, creamy cup of coffee. Aeroccino frother. The innovative design of the Aeroccino milk frother provides the perfect amount of foam for a Cappuccino or Latte, hot or cold. With two cup sizes, you can enjoy the versatility of a 1.35 oz espresso shot or an 8-oz cup of delicious Nespresso coffee. The versatility of the Vertuoline is matched only by its simplicity. One-touch commands deliver the perfect beverage with minimum effort. Blend Recognition. A state-of-the-art sensor reads the barcode on the Vertuoline coffee capsules, adjusting the brew settings to match particular blends. With the Vertuoline, you no longer have to choose between the perfect shot of espresso or the perfect cup of coffee. The Vertuoline allows having the best of both worlds with its patented brewing and frothing systems. 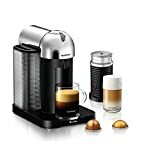 Nespresso continues to be the leaders in single serve coffee with this latest innovative design, bringing the coffee shop experience into the comfort of your own home. Become the envy of your neighbors with your very own personal barista! The Mr. Coffee Café Barista is the perfect machine for bringing the coffee house experience into the comfort of your home. Choose lattes or cappuccinos, single or double shot, with a single press of a button. The automatic brewing and frothing guarantees barista-level perfection for each and every drink been made and what’s more – it’s priced under $150! It’s for sure among the best machines because of its pricing part and the quality of drink it makes. Single touch controls. The Café Barista control panel enables you to choose between single shot or double shot drinks with a single touch of a button. Hands-free milk frother. With an automatic milk frother, you can get the perfect foam for a cappuccino or latte every time. Adjustable tray. The cup tray of the Café Barista is adjustable, allowing for large or small cups depending on how much caffeine you need. No hassle milk reservoir. The milk reservoir is easy to remove, making cleanup quick and hassle-free. No hassle water reservoir. The water reservoir is also easy to remove, making the filling and cleaning quick and effortless. Removable drip tray. The drip tray simply lifts off, allowing for quick and easy cleanup of any wayward drips and spills. Complete range of accessories. Filters for both single shots and double shots are included, along with a measuring scoop, coffee tamper and a book of coffee drink recipes. Self-cleaning. An automatic cleaning cycle is available, guaranteeing your machine stays well maintained without any effort on your part. The simplicity of the controls is only matched by the simplicity of the maintenance and cleanup of the Café Barista. Now, you can enjoy the perfect latte any time without having to leave your house. Impress your friends, or simply spoil yourself! For people with a little budget, this is the one to owe. We always wanted to include a machine that costs under $100, and EC155 is our choice for that. With over 5000 reviews on Amazon, De’Longhi EC155 is already serving many homes and offices. Use Pod or Ground Coffee : One can use both ground coffee or pods with dual functionality patent holder. So if you are not in a mood to grind, tamp and prepare – use pods instead. Priming Option – With priming option, you can avoid annoying start-up operation. Easy to Use – The interface is simple and easy to use so that anyone at home can prepare delicious drinks at home. Separate Thermostats – With this, the steam temperature and water temperature can be controlled separately. Stainless Steel Boiler – The machine comes equipped with a durable boiler to withstand in long run. Swivel Jet Frother – Swivel frother is a convenient thing for portability. So, on a small budget, the machine that withstands is De’Longhi EC155 having many features premium machines generally have. If you are seeking an espresso machine in the budget of drip coffee machine, this one is perfect to go. It can be a tricky process to find your perfect espresso coffee machine from the numerous models in the market. We have written this buying guide for introducing you to the most important aspects of espresso machines to consider. These parameters actually affect the quality of brewing and that’s why are important feature to think about. How much are you able or willing to spend? Do you have any experience pulling espresso shots? How often do you drink espresso-based drinks? Once you have a better handle on the priorities, it’s time to take a look at a few models, that are considered to be the best picks. When it comes to choosing an espresso machine, there are two types to consider: steam or pump powered. Even though there is the use of higher temperatures in steam espresso machines, they are not very good at creating the golden brown foamy layer or crema – something that is a characteristic of most espresso drinks. Given that high temperatures are used, the machine can produce a burnt taste. Pump powered espresso machines use a thermo-block system that enables them to produce 15 or more bars of pressure. The thermo-block system produces perfect crema and the steam that is required for making enjoyable cappuccinos and lattes. It is recommended to choose pump powered espresso machine over steam because they produce much better café quality espresso flavor. However, you must know that steam-powered espresso machines are more affordable than pump machines. Manual Machines: It is fair to say that these machines are for those people who are not reluctant to put some work into their espresso.These machines are not only elegant and have an old charming design but are capable of producing an exceptional espresso if operated properly. The most distinctive thing about these machines is the liver. Some have a direct lever or spring piston lever design while others have electronic pumps in place of the lever (advanced ones). Semi-Automatic Machines: This machine is classified as semi-automatic because of the reason that the brew cycle must be manually controlled by the user. With this machine, the user is in complete control of everything from grind setting to the extracted espresso shot. 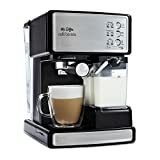 Super Automatic Machines: What really distinguishes super-automatic espresso from a semi-automatic is the inclusion of built-in grinder and milk frother. Even though there are some semi-automatic machines that come with a built-in grinder, but most do not. It is an essential component of any espresso machine that holds the ground beans before and during the entire brewing process. All espresso machines (manual, semi and super) have portafilter. There are different kinds of portafilters in the market such as pressurized portafilters, non-pressurized portafilters, and pod portafilters. If you are a hands-on type of person, it is recommended to have the non-pressurized type and if you don’t like a lot of fuss, it is best to choose pressurized portafilters. You have to decide whether to buy an espresso machine with a single boiler or double boiler. The single boiler is a sealed metal container that makes espresso and also produces the right temperature for the steam used in the milk frothing step. Double boiler, as the name implies, has dual boilers and that’s why it is deemed as best in producing the quality end result. Espresso machines that have double boilers are usually equipped with a heating thermostat for both boilers that ensures one of the boilers heats water to a hotter temperature than the other boiler. It is recommended to choose the machine with dual boilers they not only provide better results but also eliminate the waiting period between steaming and brew sessions. When it comes to achieving precise water heating, semi and super automatic espresso machines are the best at it. However, if you’re into a manual espresso machine, then you should know that it enables the user to control the use of water in the shot and the best thing about manual machines is that you can introduce extra water as well. There is a cavity in group-head in both manual machines that fill up with hot brewing water once the lever is fully engaged. As the lever is pushed, the slightly elevated pressure of both boilers move water to the overhead, it happens as a result of valve opening between the group-head and boiler. The frothing device of an espresso machine is the steam wand. It has a valve on it that releases pressurized steam. You should check the bottom of the steam wand. You need to look for a steam wand that has a tip with a small hole or multiple small holes. Spring Piston Lever Machines: This machine operates with the help of an internal, calibrated spring that upon use pushes the water through coffee grounds at a precise and abating pressure. The lever is used to compress the spring into its starting position. Once you leave the lever, the spring pushes water through coffee grounds. Normally, a spring piston lever machine comes with a boiler that is designed to pull a shot of espresso and steam milk straightaway. You can easily recognize this machines as its lever’s resting position will be pointing up. Direct Lever Machines: It can be said that both direct lever and spring piston lever machines are quite similar to each other. Unlike the elevated resting position of the lever in spring pistons, the lever rests in the down position in these machines. One of the main differences between both machines is the “pump” factor. Unlike spring pistons, you are the one who applies pressure to the water by pushing down the lever. This means that you also need patience and practice to become good at applying the right pressure to get an excellent shot. It is important to comprehend that every coffee blend required a different type of pressure to achieve the “perfect shot.” Therefore, you must know that it will take some time to achieve a good “touch.” But in the end, it all comes down to your romance with espresso. Practice and patience can result in a divine shot of espresso every single time. Espresso machines, especially manual ones, have installed water tanks that can easily prepare 6-10 or more cups. However, the water reservoir size depends on the brand and the machine. With semi and super automatic machines, the water reservoir size is bigger as compared to manual machines. Most commercial and pro-consumer espresso machines come with the direct water connection feature. There is a general opinion that tap water shouldn’t be used. But it all depends on whether you need a machine with this feature or not. You can usually find the digital display on expensive espresso machines e.g. super automatic espresso makers. With a digital display, it all becomes more convenient for the user. If you are into making espresso without any fuss at all, you should go with an espresso maker that is equipped with a digital display. If you ask any expert, that person will tell you that one of the biggest factors in producing a perfect shot of espresso is pre-infusion. 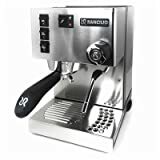 Given that the users of automatic and semi-automatic espresso makers have no control over how long the water sits over the bed of coffee ground, spring piston lever and direct lever machines (manual espresso makers)give you this control. Typically, there is 1.2 to 1.4 bar boiler pressure in spring piston lever machine. However, the most important part is how you take the best advantage of pre-infusion. This means that you need to keep a close eye on the coffee grind, dose, temperature of water and almost everything that plays a role a making espresso. A built-in grinder ensures that you get a fresh shot of espresso whenever you want it. Machines with integrated grinder are highly recommended to those people who are conscious about freshness and taste of their hot beverage. Super automatic espresso machines come with built-in grinders. However, if there isn’t an already integrated grinder in the machine (such as manual espresso maker), you could buy a separate one. But then again, it’ll be a little less convenient. Manual espresso makers are not big and do not take too much counter space. However, semi-automatic and super-automatic espresso makers can take extra counter space. Be it manual, semi, or super machines, the first-timers will find it a bit tricky to use the machine. However, the interface of all espresso makers is quite easy to understand and use. Needless to say, patience and practice are required in using these machines. Finally, which among the above is the best espresso machine for you? Obviously, this is going to be a personal choice that depends on your own taste, budget and priorities. We’ve listed above the top rated home espresso machines from which you can pick your favorite. The overall best value for money is the Breville Duo-Temp. If you’re not concerned about programmability and don’t mind manually timing the length of shot, you are getting a really good machine for just a few hundred bucks. The choice of pressurized or non-pressurized baskets is great if you’re just starting out but want to improve barista skills over time. Additionally, the Rancilio Silvia is great for experienced baristas who want the quality and feel of a commercial model at home. Also, the solid brass construction of the group head and other key parts means that you will enjoy this machine for years to come. Moreover, if you are looking to be catch up with professional barista skills, Nuova Simonelli Oscar Pour Over and Breville Barista Express are the best options. It will cost on the higher side but deserves as there are no compromises made in the product.